Kate Wilson is one of the women, whose stories of their abusive relationships with undercover police, have shocked the nation. 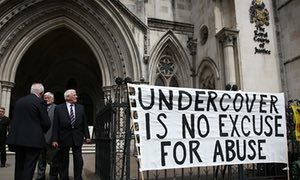 She is taking what might be a unique case against the Metropolitan Police concerning the abuse of her human rights when she was deceived into a long term intimate relationship with Mark Kennedy, an undercover officer infiltrating social and environmental justice groups. It is being held at the Investigatory Powers tribunal, the secretive court that oversees complaints about the states covert intrusion into our lives. There is a demo called before a case hearing, where the police are applying to have the whole case heard in secret, meaning Kate or her solicitors would not be able to attend the hearings, argue her case in court, hear or contest any of the police’s evidence, or even hear a reasoned judgement at its conclusion. It is essential that such appalling abuse of Kate’s and other women’s human rights is challenged, and that this is done in the open, so the truth about what happened can come out, and the public can be reassured that it is being dealt with properly and accountably. Relationships are one of the most profoundly disturbing tools of social control so far unearthed as part of the decades-long activity of undercover units. It is essential that people are able to participate in social and environmental justice campaigning without fear of such abuse. This case is the first time the Police have had to answer human rights claims about their undercover officers’ deception of women into intimate relationships. Kate is in an almost unique position to be able to do this, and it is possibly our best opportunity yet to force changes in the laws that oversee undercover policing. Public outrage at the treatment of women at the hands of the police has meant that they have not been able to sweep these cases under the carpet, and it is essential that we continue to show our support for and solidarity with these brave women holding the state to account. Come to the demo to show your support! Come into the court hearing itself at 11am, and show the Judge the level of public interest. If you can’t make it, then make noise on social media – talk about it to your friends, or write to your MP. We must keep up the public pressure and hold the state to account.